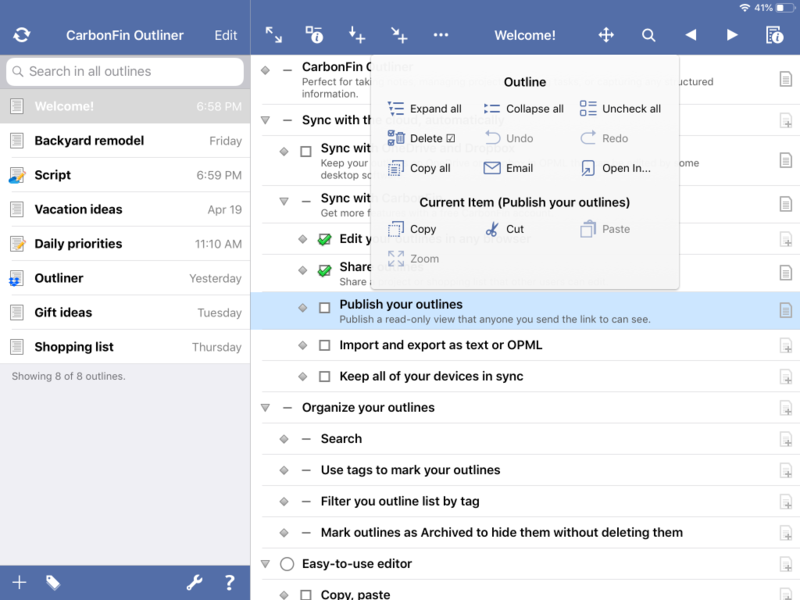 CarbonFin Outliner allows you to organize your thoughts, tasks, and projects. 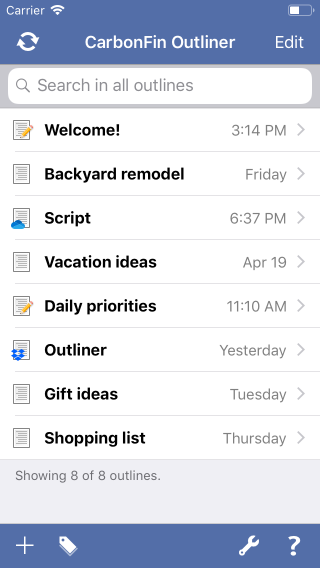 Easily create a todo list for today, or track an entire project anywhere you are. 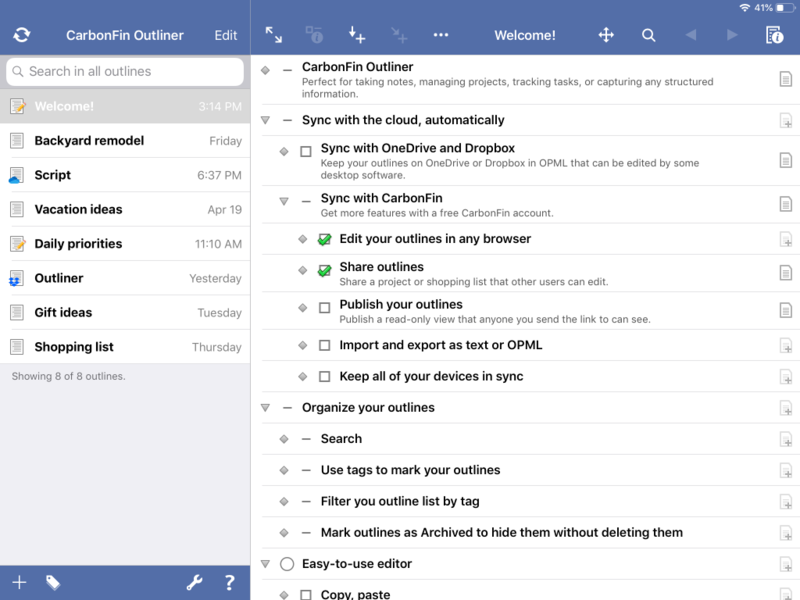 Share your outlines, edit your outlines online with the free Outliner Online, and collaborate with other Outliner users. 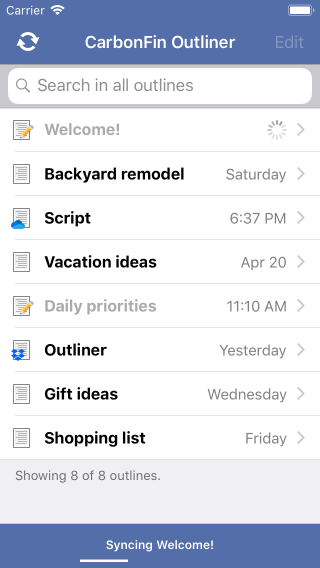 The home screen shows all your outlines, and their current sync status (a pencil on the outline icon indicates that the outline has been modified since the last sync). 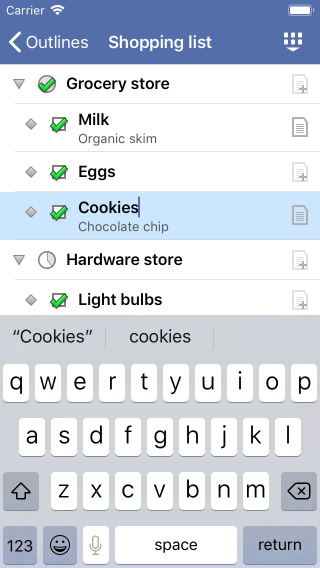 Tap the '+' button to create a new outline, or 'Edit' to reorder them. Assign tags to your outlines, then filter the list by tag to keep organized. 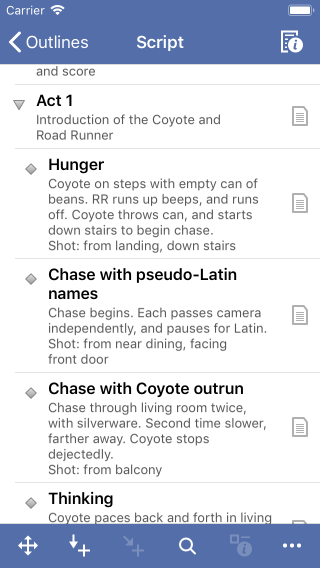 You can also search across all your outlines from the home screen. 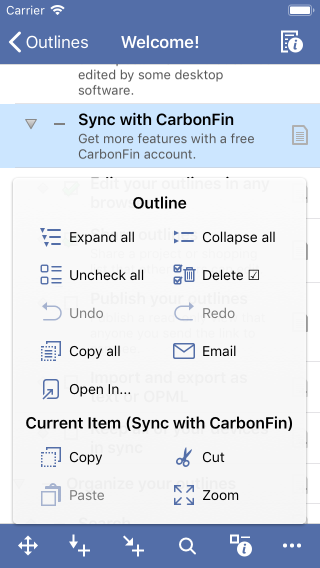 Sync your outlines securely to Outliner Online, the free online companion to CarbonFin Outliner. Syncing protects you from data loss, and allows you to import, export, and edit your outlines from any web browser. Automatic sync keeps your outlines always up-to-date. 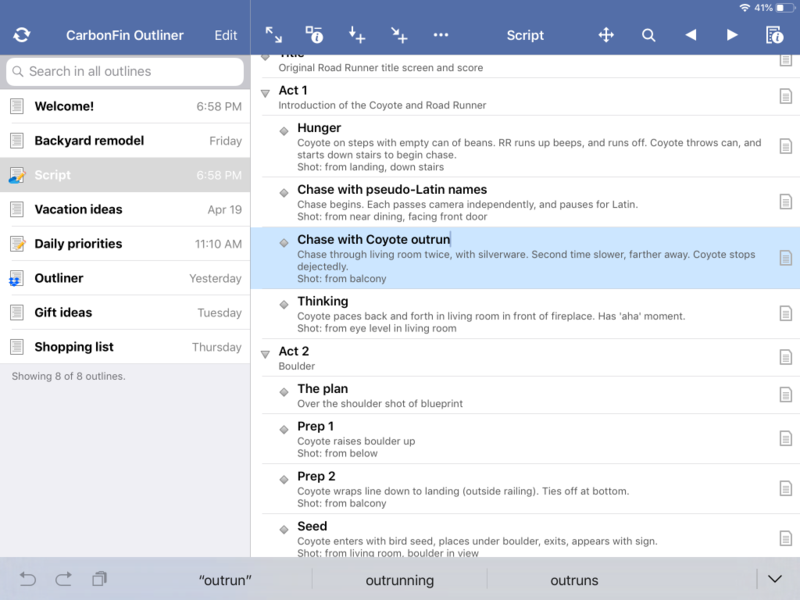 Share outlines with other Outliner users, allowing two or more people to view and edit an outline. Publish an outline so that anyone with its public URL can view it. Sync your outlines with Dropbox as OPML files. 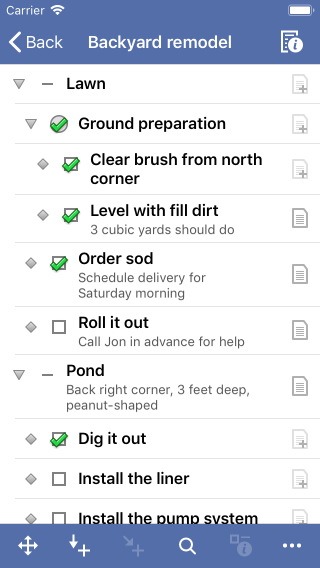 Outliner is great for task lists, such as a shopping list. Just tap the checkbox to mark each one complete, or tap the pie chart next to a parent task to mark or clear all subtasks. Outliner is especially good at managing projects. Organize your project into hierarchies of tasks and subtasks, and see at a glance how each part of a project is progressing. Not everything you store in Outliner is a task. 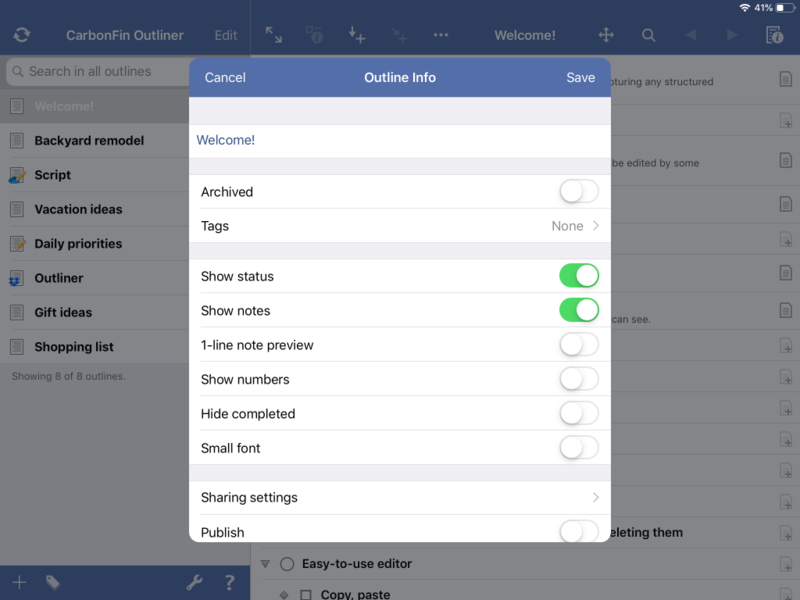 For flexibility, each outline has settings to allow you to show or hide the checkboxes, show or hide the notes preview, or use a small font to give you more room for text and notes. You also have the option to show numbering for items. You can easily export any outline by emailing it as plain text, or industry standard OPML. Using OPML allows you to export your outlines for desktop editing in your favorite outliner. You can also import OPML files directly from Mail attachments.